A simple, light, rustic soup, this recipe is easy to make and a great accompaniment to a main course or side dishes. 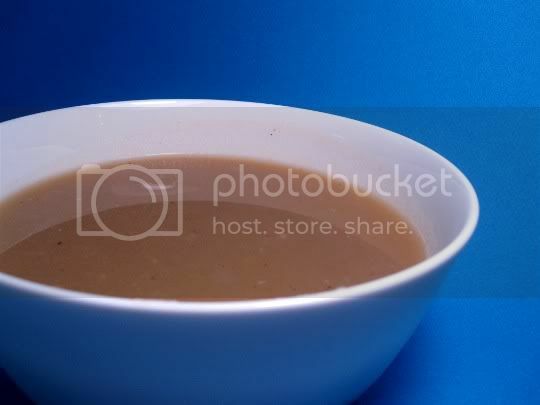 Water, vegetable broth, whole garlic cloves, and diced potatoes are added to sauteed onions. The mixture is simmered for 20 minutes, then all is whirled in a food processor until smooth. You will definitely need to add salt and pepper to the processed soup; I added about 1/2 teaspoon pepper and 3/4 teaspoon salt. This was the perfect amount for me (well, maybe I should have gone a little lighter on the pepper), but adjust to your liking. The soup is smooth, velvety, and slightly thickened thanks to the potato. It takes on almost a roasted flavor, and the garlic is definitely in the forefront. For a soup with only five ingredients, the end result is good...but nothing to write home about. And one more thing: the recipe suggests 4 servings, but it's definitely double that. You'll probably be better off halving the recipe. Make again? Probably not. The soup is good, but just a little too boring for me.